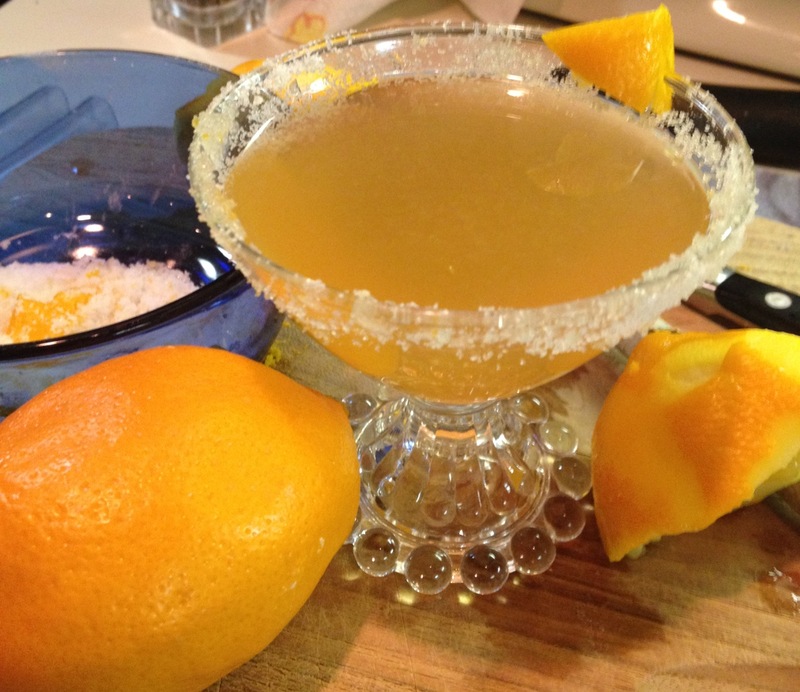 Mmmmmmmmmmmmmm Meyer Lemons. The part tangerine tasting lemon that is the shape of an average lemon but a different color and different taste and smell. See? 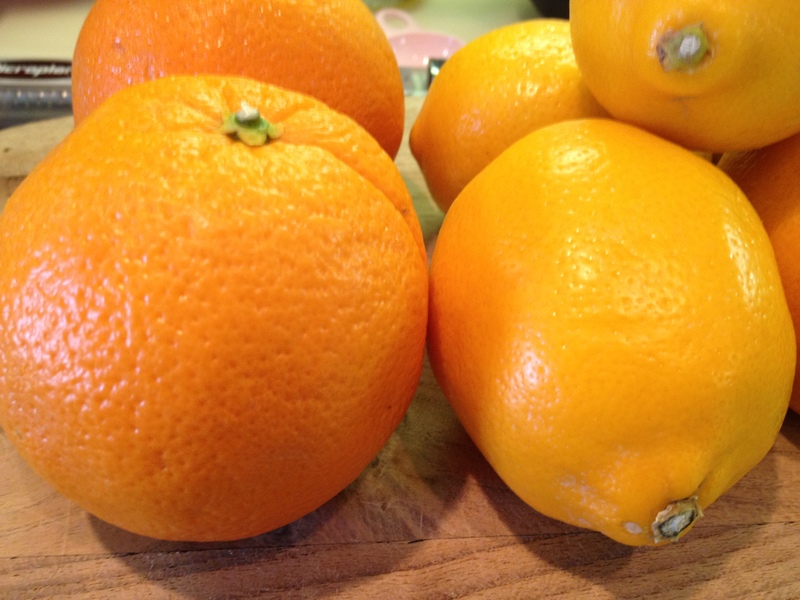 Here they are below next to some navel oranges and below that you can see the contrast in color next to the yellow border of my dish. They’re closer in color to an orange than a lemon. Here’s a good article about them but, at the risk of sounding like a snob, they’re hardly undiscovered 🙂 And conveniently I have a pound cake pan with a lemon pattern on top. Cute no? Note: this recipe calls for a few different additions of the lemons-juice, zest etc…get 3 large ones and that will be just enough. Preheat oven to 315F. Spray a 9×5 loaf pan with non-stick cooking spray. Set aside. In a medium bowl combine the flour, baking powder and salt and whisk to combine. In a small bowl whisk the sour cream and lemon juice together. 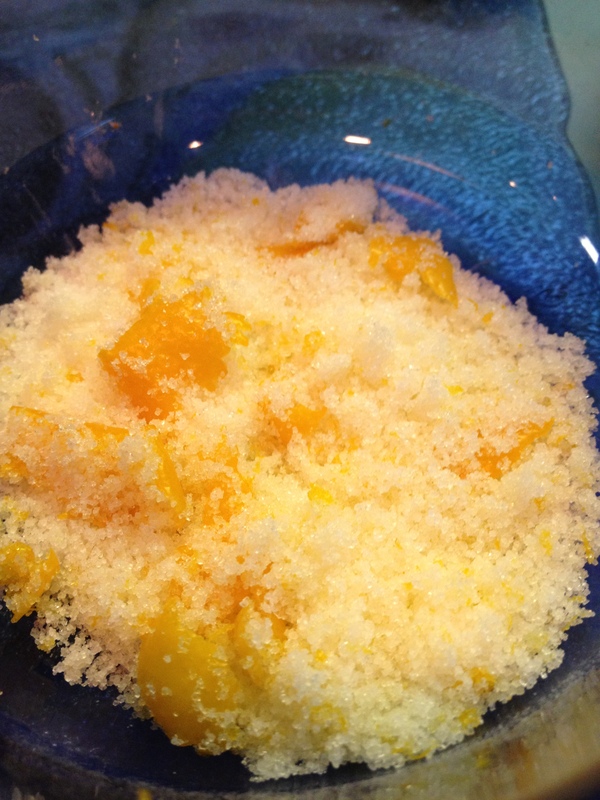 In the bowl of a stand mixture fitted with the paddle attachment combine the lemon zest and sugar. Using your fingers rub them together until the sugar is moist and fragrant and evenly mixed together. Add the butter to the bowl and beat on medium speed until very pale and fluffy (about 3-4 minutes). Scrape down the sides of the bowl. Mix in th eggs in 3 additions, beating well after each addition until the mixture is smooth (stop to scrape down the bowl as needed). With the mixer on low alternately add the dry ingredients in 3 additions and the sour cream mixture in 2, starting and ending with the dry. Once all of the ingredients have been added scrape down the bowl then beat on low for another 30 seconds to combine. Use a rubber spatula to make sure the batter in the bottom of the bowl is uniform. Pour the batter into the prepared pan. Smooth the top then tap the pan on a hard flat surface to release any air bubbles. Place a piece of aluminum foil under the cooling rack. Bake the cake for 55-65 minutes or until a toothpick in the center comes out with just a few moist crumbs. Place the pan on a wire cooling rack, let it cool for 10 minutes then turn it out onto the rack. While the cake is in the oven make the syrup. 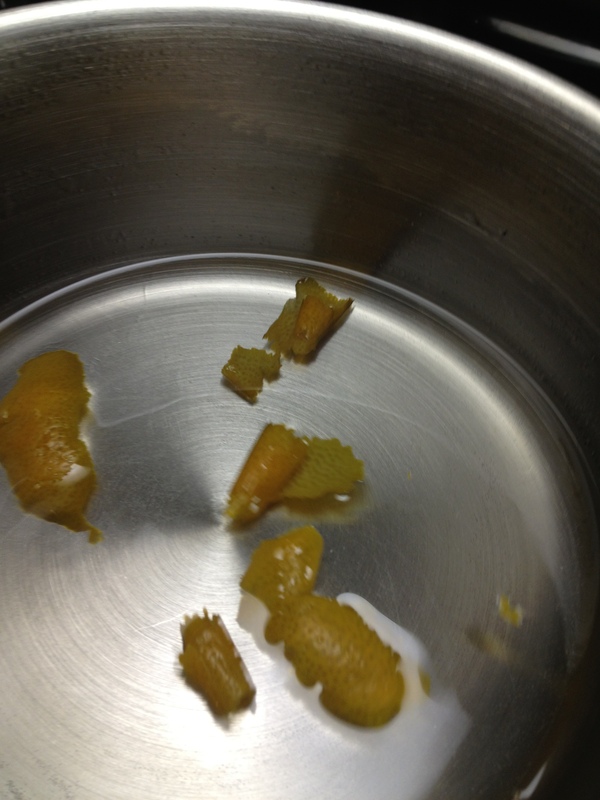 Combine the sugar and lemon juice in a small saucepan cook over medium-high heat. Cook, stirring frequently, until the sugar has dissolved. Bring to a simmer, cook for 2 minutes and then remove from heat and set aside. 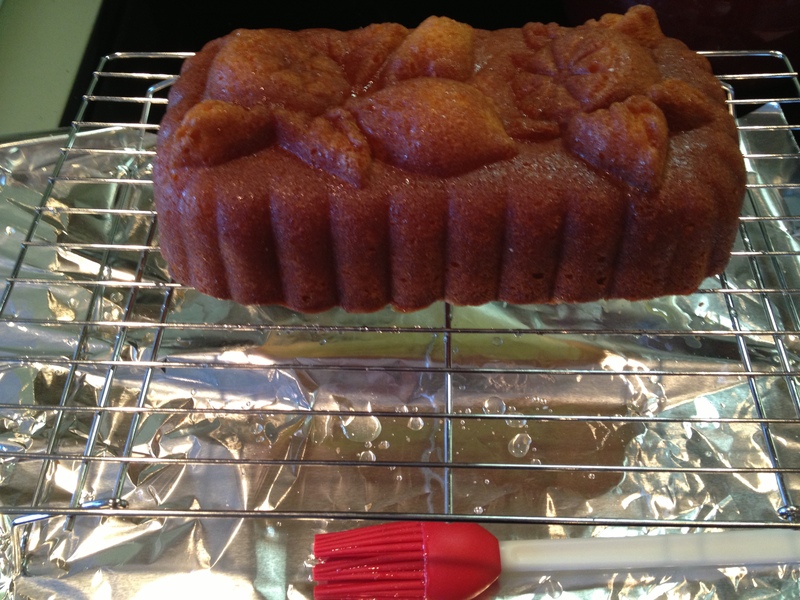 Once you’ve turned the cake out of the pan onto the rack brush the top and sides with the syrup. Reuse any that falls below onto the foil below. Be sure to use all of the syrup. Then let the cake cool completely–about 2 hours. When the cake is cooled make the glaze by combining the confectioners sugar with the juice in a small bowl and stir to combine. Drizzle it carefully over the cake covering it completely. Let the glaze set for 15 minutes before serving. I printed this from someone’s blog but didn’t write down who’s it was. If it’s yours please let me know. 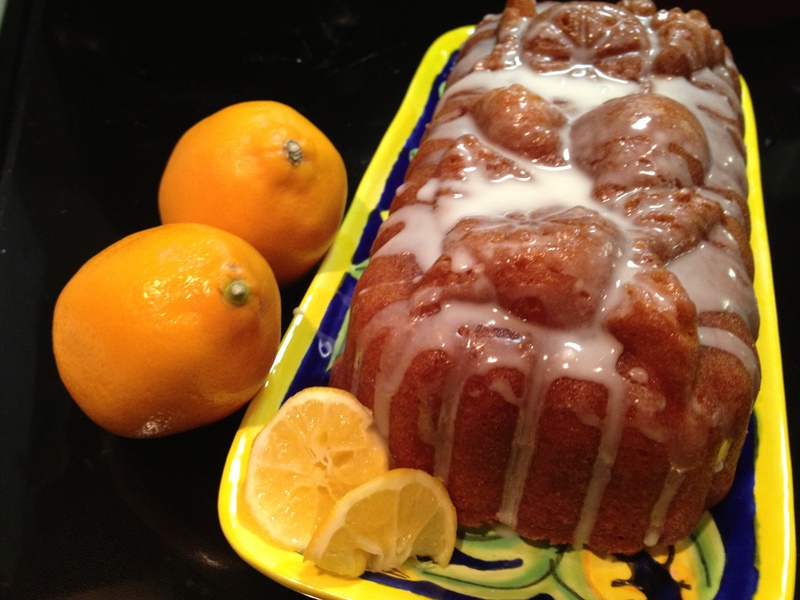 I drizzled a little extra juice that I had left over all over the cake after I poured on the glaze. And don’t waste the left over pieces that you’ve squeezed-there’s still a ton of flavor in there-it would be a shame to throw out that deliciousness!! Note: this cake will keep for 5 days wrapped tightly at room temp for upto 5 days or freeze (unglazed) for up to 1 month. Here is a photo of the cooling rack with foil underneath-the syrup will drip so it’s nice to catch all of it. Sometimes you just want a nice big sandwich. I found the original recipe on Melissa’s great blog http://iwasborntocook.com/ in the Top Posts of 2012 post and I immediately printed it out. I adapted it a bit with the cheese and rolls. Slow cooker on Sunday? Yes. 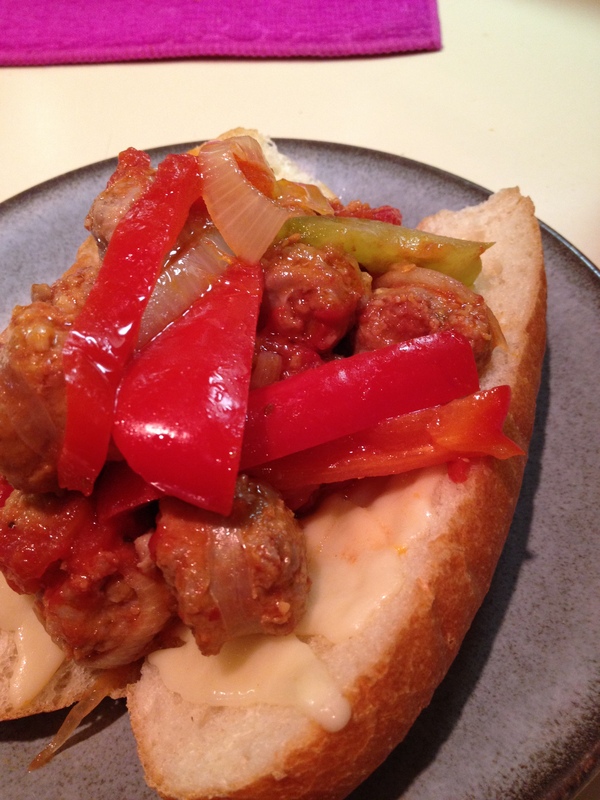 Sausage, onions and peppers on a roll? Yes. And I added the cheese. Super easy, super yummy. Would be great for football-watching days. sandwich rolls (mine were hot dog sized from Hot & Crusty). You’ll need substantial rolls to hold up to the sauce and contents. In a large skillet heat a bit of the oil and brown the sausage on all sides. (This may have to be done in batches) Then place sausage in slow cooker. Add the rest of the ingredients to the slow cooker. Cook on low for at least 4 hours. Half rolls, place cheese on either one or both sides, and toast until the cheese melts. Spoon sausage mixture onto rolls and enjoy. Note: my slow cooker is a 5qt and it was just about to the top of the insert so if you have a smaller cooker I’d make less. MMMMMMM spinach. A lot of people aren’t fans but I am. This is such an easy, super super fast recipe it’s not even funny. No kidding-about 5 minutes from start to finish and the spinach at the end is delicious-garlicy, lemony, spinachy. 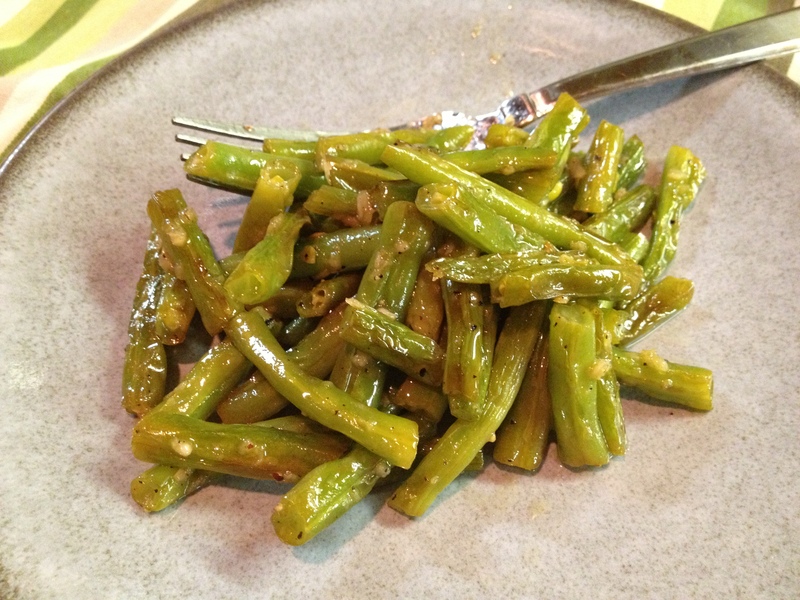 Pefect side dish!! Note: since it was just me I was cooking for when I made this it’s just one serving-about 1 cup give or take was the ending amount. You can easily multiply it up for more servings. Heat 1 tsp of the oil over medium-high heat until shimmering in a heavy bottomed pot large enough to hold all of the spinach. Add the spinach, cover, and cook stirring occasionally until the spinach is completely wilted-just a few minutes. 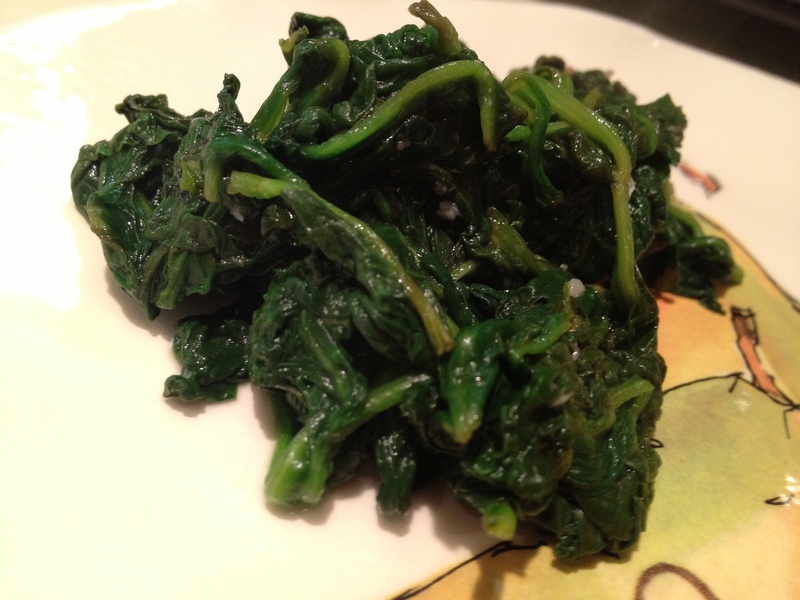 Transfer the spinach to a colander and squeeze out as much liquid as possible using tongs. Add the remaining oil, garlic and the salt to the pot and cook over medium heat until fragrant, about 30 seconds. Stir in the spinach and toss to coat. 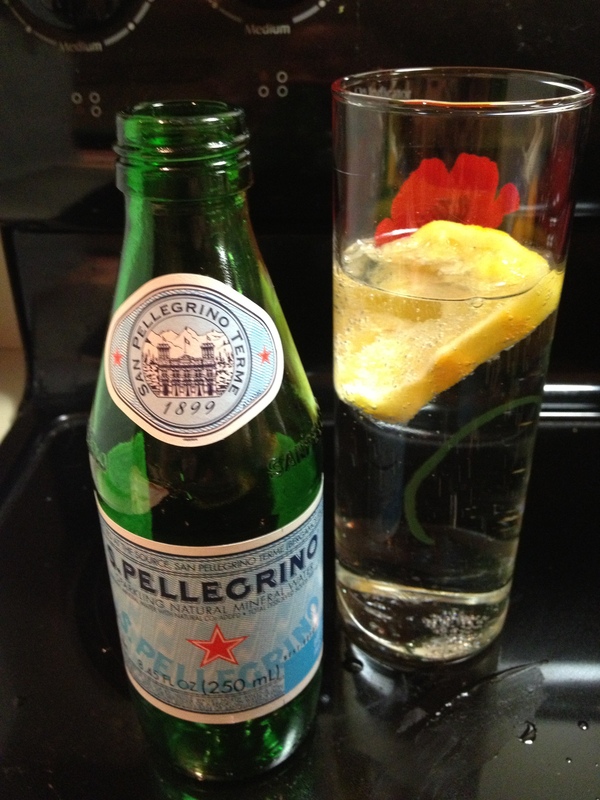 Off the heat stir in the lemon juice season with salt and pepper to taste and serve immediately. 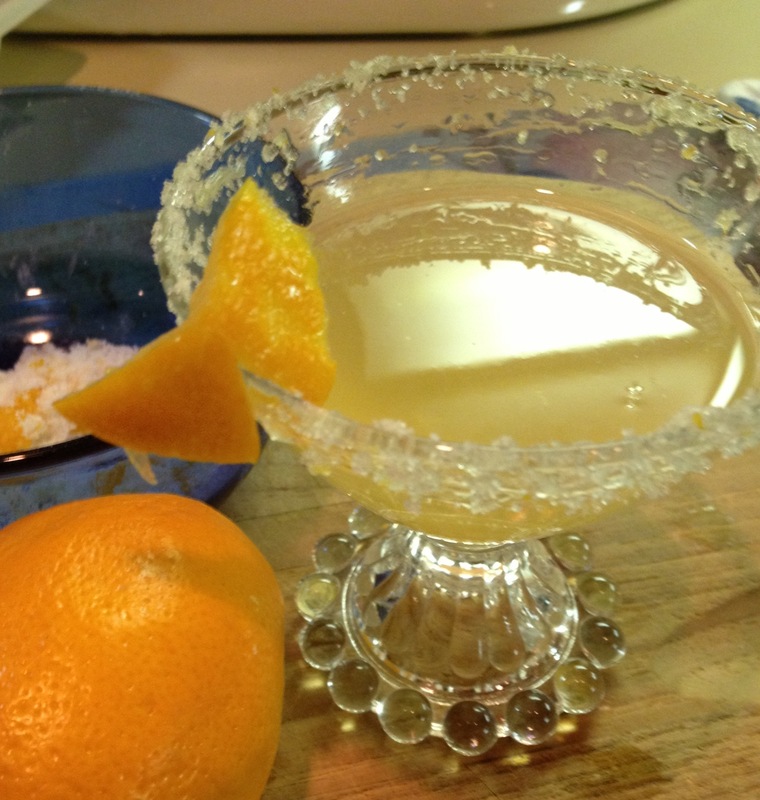 Adapted from America’s Test Kitchen Healthy Family Cookbook. I have 4 huge 3 ring binders at home that are filled with recipies that I’ve pulled out of magazines, off of the web, out of cookbooks etc.. for years. This recipe came from the Jan/Feb 2011 Cooking Light Magazine. 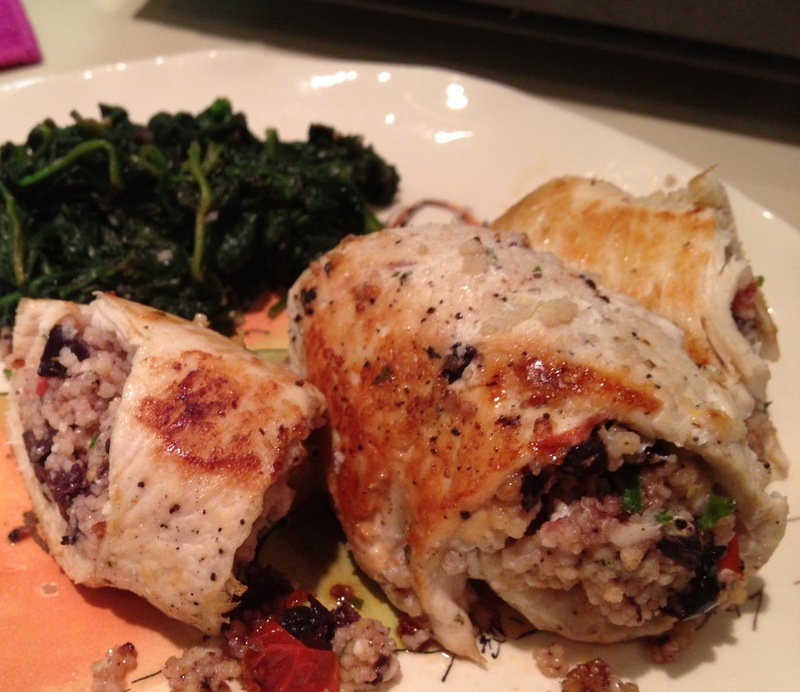 It was really easy to make, is pretty darn healthy at only 270-/* calories per chicken breast and is SUPER tasty. The olives, tomatoes and feta make the pretty bland blank canvas of chicken breast really delicious-briny, salty, tomatoey. Yummy! Sorry-this photo isn’t the best. I was starving by the time it was time to eat. 1. Bring broth to a boil in a small saucepan; remove from heat. Stir in couscous. Cover and let stand 4 minutes. Place couscous in a small bowl that is large enough to hold the couscous and other ingredients through garlic; fluff with a fork. Cool for 10 minutes. Add 1/4 teaspoon salt, 1/4 teaspoon pepper, and next 8 ingredients (through and including garlic); toss. 2. If chicken is not at the desired thickness place chicken between 2 sheets of plastic wrap; pound to 1/4-inch thickness. Divide couscous mixture evenly among breast halves; roll up jelly-roll fashion. Secure with wooden picks. Sprinkle chicken with 1/4 teaspoon salt and 1/4 teaspoon pepper. 3. Preheat oven to 400°. 4. Heat a large ovenproof skillet over medium-high heat. Coat pan with cooking spray. Add chicken to pan; cook for 6 minutes or until browned; turn chicken over. Bake at 400° for 5 minutes or until chicken is done. Adapted from Cooking Light Jan/Feb 2011. I pulled this recipe out of the Food Network Magazine back in November of 2010. It sounded kind of different and good. I’ll be honest-the dish as a pasta dish didn’t live up to the expectation I had for it HOWEVER as a cauliflower dish it would be absolutely delicious!! So next time I will omit any part of the recipe for pasta and just make cauliflower with panko and onions. I suggest you do the same. After all who doesn’t need a new way to cook cauliflower? Toasty and garlicky panko and french fried onion pieces with crispy cauliflower pieces-what’s not to love? Skip the pasta part. Bring a large pot of salted water to a boil and cook pasta. When pasta is done reserve 1 cup of the cooking water, drain it and return it to the pan and toss with 1 tbsp olive oil. Set aside. Heat 2 tbsp olive oil in a large skillet over medium heat. Add the garlic and cook about 30 seconds. Add the panko and onion and cook, stirring, until lightly toasted about 3 minutes. Transfer to a plate, wipe pan clean. Heat remaining 1 tbsp olive oil in the skillet over medium-high heat. Add the cauliflower and cook until the edges brown, about 4 minutes. Add the red pepper flakes and toast 30 seconds. Add the reserved pasta water and cook until the liquid is reduced by half and the cauliflower is crisp-tender. Add the pasta, onion mixture and parmesan to the skillet and toss. 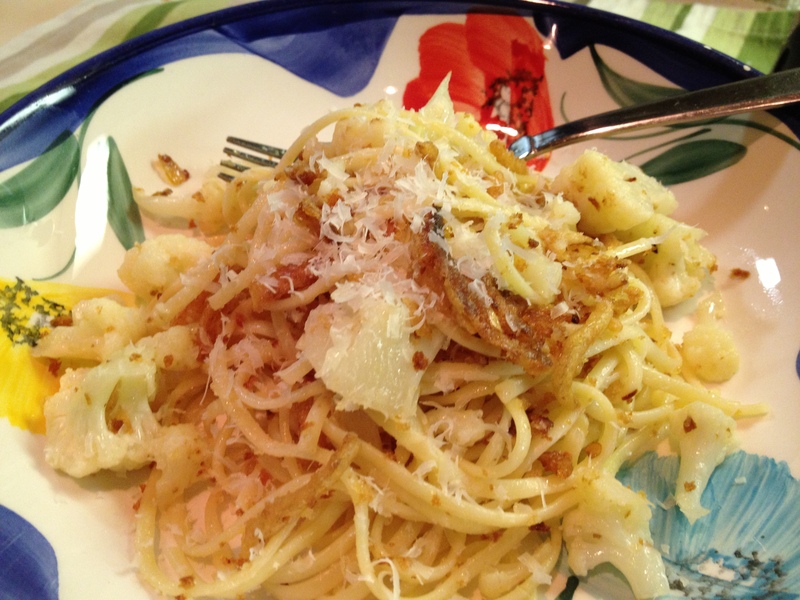 Season with salt and more parmesan. Adapted from Food Network Magazine November 2010. 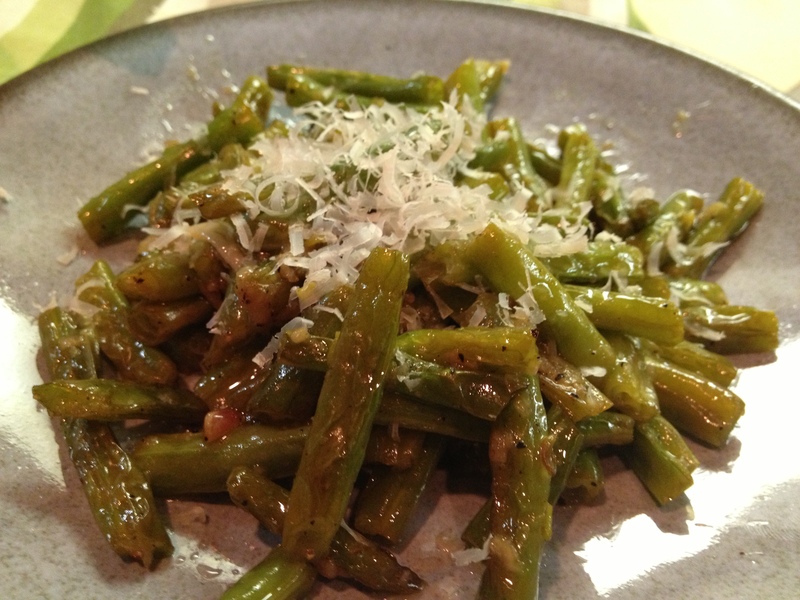 Green Beans are so versatile aren’t they? Sauteeing them is easy and they stay crisp and delicious. I made this as a side to my Cauliflower and Onion Linguine but it would also go great with chicken, beef or just about anything else. Heat 2 tsp of oil in a 12 inch non-stick skillet over medium heat. Add the beans and ¼ tsp salt and cook until spotty brown, 4 to 6 minutes. Clear the center of the skillet and add the remaining tsp oil and garlic. Cook, mashing the mixture into the pan, until fragrant, about 30 seconds. Stir into the beans. Add the water, cover, and cook until the beans are bright green and still crisp, about 2 minutes. Uncover, increase the heat to high and cook until the water evaporates and the beans are crisp-tender and lightly browned, 3 to 5 minutes. Remove pan from the heat, add lemon juice, salt and pepper to taste and serve.